President Xi Jinping will meet with US President Barack Obama soon, it was disclosed on Monday. 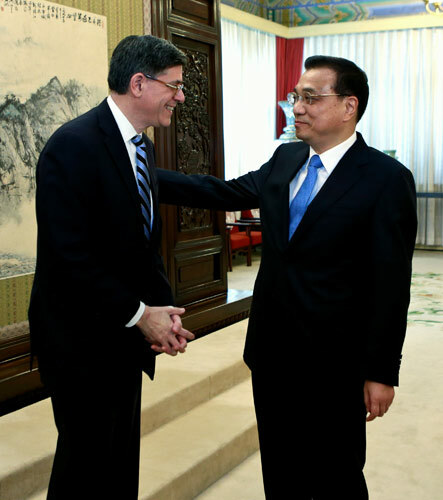 Premier Li Keqiang made the announcement after he received Jacob Lew, special representative of the United States president and the US treasury secretary, in Beijing. The meeting between the two presidents would help to improve relations between the two countries, Li said. An official announcement about the meeting has yet to be released by the Chinese Foreign Ministry. Lew was in Beijing after attending the G20 meeting of finance ministers and central bank governors in Shanghai late last week. At this meeting, finance officials from the member nations pledged efforts to prevent competitive devaluation of currencies and to facilitate global economic growth. The meeting between Xi and Obama will take place after the National People's Congress holds its annual session in Beijing, beginning on Saturday, to decide on the nation's development this year and, more important, its social and economic program for the next five years. The White House website said the fourth and final Nuclear Security Summit will be held on March 31 and April 1 in Washington, DC. When meeting with Chinese Foreign Minister Wang Yi last week, Obama said he hoped Xi would attend the summit. Li, when meeting with Lew, said good Sino-US relations were very important for both countries, and China placed great emphasis on its economic and trade cooperation with the US, which Li described as an "accelerator" for the overall bilateral ties. Li said it was good to see that during the G20 meeting of finance ministers and central bank governors that major economies would enhance coordination on macro policies. Li also said the meeting went smoothly and had sent a stable message to international society. Wang Yusheng, a researcher at a government think tank in Beijing, said the Chinese and US leaders last met at the Paris Climate Summit in December. Their frequent meetings would be "most helpful" for bilateral ties, said Wang, executive director of the Strategy Research Center at the China International Studies Research Fund. "Every time a subtle situation seems to emerge in the bilateral relations, a face-to-face meeting between leaders of the two nations will help to sort things out," Wang said, adding that "there are still some uncomfortable areas in Sino-US ties". After Li's meeting with Lew, Zhu Guangyao, vice-minister of finance who also attended the meeting, said China was glad to see many of its policy proposals were included in the G20 meeting's final document. Xu Hongcai, a researcher of the China Center for International Economic Exchanges, another government think tank, praised the Shanghai meeting for reaching a consensus among G20 finance officials to seek a balanced and sustainable way to boost the global economy.